This MyQUEST achievement is a small segment of many celebrations and accolades enjoyed by Sunway College. Founded by Tan Sri Dr Jeffrey Cheah AO, Sunway College is one of the leading institutions of the Sunway Education Group which is owned and governed by Malaysia’s largest not-for-profit social enterprise, the Jeffrey Cheah Foundation. Dedicated to quality education, Sunway College offers pre-university programmes, undergraduate and postgraduate level twinning programmes with Victoria University, and professional accounting courses through the Sunway TES Centre for Accountancy Excellence such as the Association of Chartered Certified Accountant (ACCA), Certified Accounting Technician (CAT), Institute of Chartered Accountants in England and Wales (ICAEW), Certificate in Finance, Accounting and Business (CFAB), Malaysian Institute of Certified Public Accountants (MICPA), Certified Internal Auditors (CIA), Chartered Financial Analyst (CFA) and Certified Practising Accountants (CPA). Teo Ee Sing, Executive Director of Sunway College was pleased with the consistent and excellent performance of the College. “I’m happy to see Sunway College grow and being regarded as an outstanding college by MyQUEST. The successes so far should be attributed to our inspirational and dedicated faculties and teams,” said Teo. 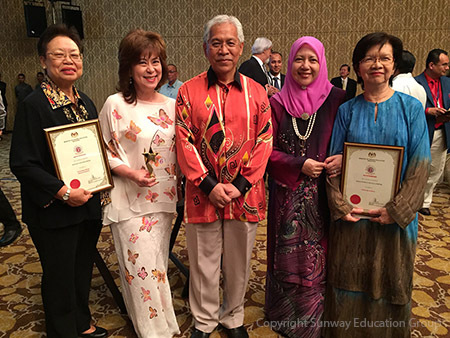 Dr Khatijah Khalid, Chief Executive of Sunway College and her team have been instrumental in achieving this. “The MyQUEST achievement certainly serves as a positive motivation for us all to reach greater heights. While we thrive to maintain the current standards, we will also work on improving ourselves in other areas of the MyQUEST. Just like the way we nurture our students holistically, we are also constantly improving Sunway College to be a well-rounded quality education provider in Malaysia,” said Dr Khatijah. Doubling the joy, Sunway College Johor Bahru also achieved 6 stars in the cluster-based (general programmes) rating. The Sunway College JB and Sunway College KL's MyQUEST awards were received by Hor Poh Choo, Principal of Sunway College JB and Dr Khatijah respectively, in the presence of Dr Elizabeth Lee, Senior Executive Director of Sunway Education Group and Sunway University at the official ceremony. Besides MyQUEST, Sunway College was also ranked as Asia’s No. 1 in Graduate Employability together with Sunway University by the Student Barometer Survey Entry Wave 2014. The Survey undertaken by i-graduate, tracked feedback from over 2 million students from 1,400 universities, colleges, schools and government agencies across 30 countries. In Asia, over 32,000 students participated in the Survey.